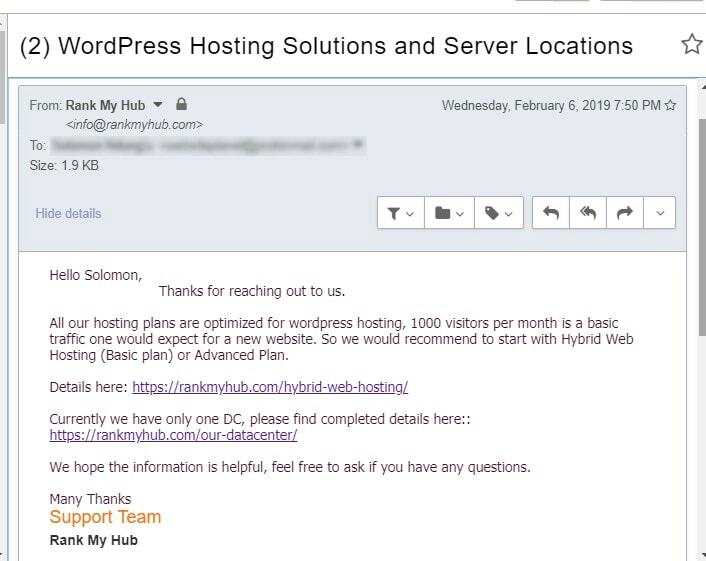 Rank My Hub Review 2019: Is Rank My Hub a Good Hosting? Rank My Hub is an Indian website hosting provider that uses Canadian servers to deliver shared web hosting solutions to small and medium-sized businesses in India and other countries around the world. Rank My Hub is a relatively small Indian web hosting provider that was started in 2014. It offers an array of internet services including shared web hosting, search engine optimization, and web design. Although Rank My Hub primarily targets Indian businesses, its data center is located in Quebec, Canada. Rank My Hub’s data center in Montreal houses servers that are RAID 10 protected and have a reliable power backup system. It uses SSDs and LiteSpeed technology to make websites load up to 20 times faster than those hosted on traditional HDD servers. There is a 99.9% uptime guarantee, which is a little low by industry standards. This company employs isolated containers technology to provide clients’ websites with better security. The CloudLinux operating system ensures that websites with high resource demands do not affect others hosted on the same server. Rank My Hub offers free offsite daily backups as well as free restoration. Managed hosting customers enjoy dual backup services: automated and manual backup. All hosting plans come with the RVsitebuilder Pro website builder that helps you create your site without any web design or coding skills whatsoever. Rank My Hub’s hosting plans are competitively priced compared with competing companies of the same caliber in India. Prices are listed in Indian rupees and U.S. dollars and can be paid for on two billing cycles: monthly and annual. This provider’s 100% transparent pricing model implies that there are no hidden charges. You get a free SSL certificate with every domain purchased, and there is a generous 60-day free trial with no obligations. You can contact the Rank My Hub 24/7/365 support team by live chat, email, telephone, or ticket system. My exploratory email received a response within 24 hours, which politely and expertly answered all my questions. To help you help yourself, the Rank My Hub website includes an FAQ page and a Self Support page. Rank My Hub might not have the infrastructure to handle large websites with complex databases, but its hosting solutions are quite impressive for its target market of small and medium-sized businesses. What’s more, its polite and helpful support staff is a major reason why many users choose its hosting solutions. Wondering how Rank My Hub stacks up against other Web Hosting companies? Enter any other Web Hosting company and we will give you a side-by-side comparison.